Neutral to slightly fruity and estery flavour and aroma. 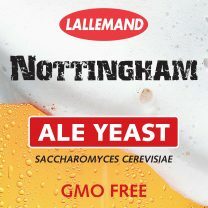 Nottingham is an English style ale yeast selected for its high performance ability and versatility. Traditional styles brewed with this yeast include but are not limited to Pale Ales, Ambers, Porters, Stouts and Barley wines. Furthermore, this highly versatile yeast strain allows for tremendous creativity when brewing beers out of the regular spectrum: in addition to these traditional styles, Nottingham gives the possibility of creating styles such as Golden Ale, Kölsch, Lager-style beers, IPA, and Imperial Stout, among many others.